Want to be a warrior and save the world? 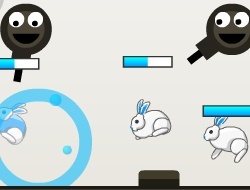 That's a lot of work to do but you can try in this skill game to see how a live battle between species looks like. Begin the fight, but don't be intimidated by the diversity of the waves because you need to handle each bunny that tries to get away and conquer the whole world. The purpose is to block any possible attack before they can't be stopped , you have a chance of redemption if one of your enemy succeed in running from you, but you have to react quickly and you are going to kill them fast. Prepare your ammunition for an epic fight and put as many weapons your budget will allow then choose the one which is more appropriate for each situation you are in. Earn money and buy new strategy to protect your base, also gain some extra points that will bring you experience. The degree of difficulty is the critical point and you could try to beat each stage if you want to become a real master. Attack of the Evil Bunny Empire 0.00 between 0 and 10 based on 0 votes.